The Michigan Coalition for Advanced Manufacturing (M-CAM) initiative was designed to help unemployed adults (including TAA-certified workers) gain the skills required to fill available jobs in Michigan’s advanced manufacturing sector. 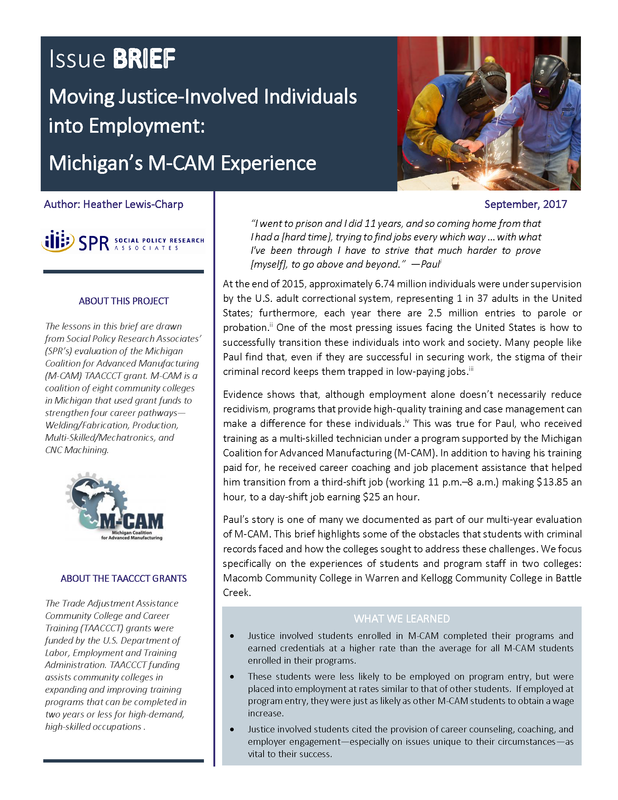 The M-CAM initiative was developed by a consortium of eight community colleges in Michigan and was funded in October 2014 by the U.S. Department of Labor through a Round 3 Trade Adjustment Assistance Community College and Career Training (TAACCCT) grant. The M-CAM leadership team selected Social Policy Research Associates as the third-party evaluator for the initiative in March 2014. SPR’s evaluation, which concluded in September 2017, included a comprehensive implementation study, an outcomes study, and a rigorous quasi-experimental impact evaluation. These evaluation activities resulted in multiple deliverables, including a comprehensive Final Evaluation Report and briefing papers, all of which can be accessed by clicking on the links on this page. SPR’s Final Evaluation Report describes key features of the initiative, factors influencing implementation, participant outcomes, program impacts, and systems outcomes. This brief explores the experiences of older workers who enrolled in advanced manufacturing training programs, drawing on data from over 1200 older students enrolled at eight community colleges in Michigan over a three-year post-recession period (2014–2017). This brief explores the role career coaches played in the M-CAM inititative, including the types of services they provided, and the challenges encountered and successes realized by the colleges as they implemented the career coaching model. This brief highlights the approaches of three M-CAM colleges that offered flexible training delivery options, including open entry program enrollment, more frequent course offerings that span evenings and weekends, and hybrid delivery systems that combined online and in-person instruction. This brief explores the M-CAM experience with the implementation of Prior Learning Assessments (PLA), focusing on the promising practices and challenges that emerged. This brief highlights some of the obstacles that students with criminal records faced and how the colleges sought to address these challenges. This brief explores both institutional and M-CAM-specific efforts to serve veterans across the eight consortium colleges. This brief describes women’s participation and experiences in manufacturing training programs. This brief highlights the employer-level outcomes of the M-CAM initiative as well as some of the employer engagement strategies that helped to support those outcomes. This brief highlights factors that contributed to the shortage of qualified manufacturing workers in Michigan as well as strategies that M-CAM colleges and employers used to address the shortage.